Though the aid package totals $1.319 billion, only 65 percent of that amount -- $860.3 million -- is assistance for Colombia. The other 35 percent is assistance for neighboring countries and increases for U.S. agencies' Andean region anti-drug operations. - Upgrades to U.S. overseas "Forward Operating Locations"
The aid for Colombia in the package is almost exactly three-quarters military and police aid, with the rest going to alternative development, administration of justice, judicial reform, assistance for displaced persons, human rights and peace. 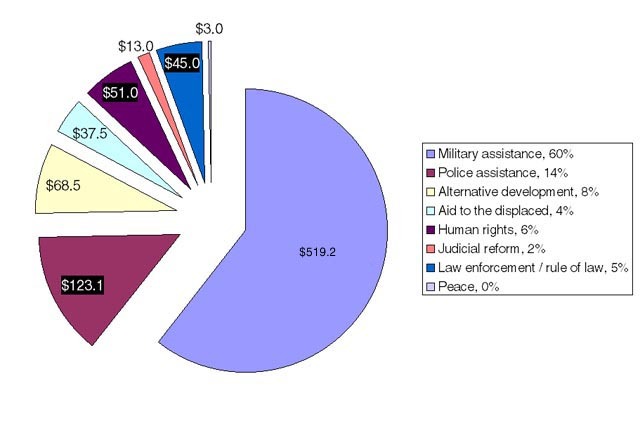 To this new assistance must be added $330 million for ongoing, previously planned programs during 2000 and 2001, nearly all of it police and military aid. The aid package will provide Colombia's army, navy and air force with $519.2 million in new assistance. Of this total, $416.9 million will fund the "Push Into Southern Colombia," a Colombian Army operation in which three newly created battalions are to create secure conditions for police anti-drug activities in the guerrilla-dominated southern departments of Putumayo and Caquetá. The remaining $102.3 million will fund the armed forces' air, river, and ground interdiction operations, military human rights training, and military justice reforms. The helicopters, logistical support, intelligence, training and other aid for the "push into southern Colombia" will mainly benefit the three U.S.-created Colombian Army counternarcotics batallions to be headquartered at a base in Tres Esquinas, on the border between Putumayo and Caquetá. Guerrillas, particularly the Colombian Revolutionary Armed Forces (FARC), have a heavy presence in this zone. The battalions will be charged with securing this zone so that police drug-eradication operations may occur without risk of guerrilla attack. The Colombian National Police (CNP), previously the largest recipients of U.S. assistance, are to receive $115.6 million through the aid package. The aid to the CNP is for a wide variety of items, ranging from helicopter upgrades and new spray aircraft to training and ammunition. The largest single police aid item is a grant of two new UH-60 Blackhawk helicopters, valued at $26 million. Other police forces, such as the Judicial Police and Customs Police, will receive an additional $7.5 million. The CNP, particularly its counternarcotics unit (the DANTI), will continue to get at least $100 million each year in assistance through regular channels like the State Department's International Narcotics Control (INC) program or emergency counternarcotics drawdowns. This aid funds the police's normal anti-drug activities, among them illicit crop eradication, interdiction, and investigations. The aid package gives Colombia $68.5 million in new funding for alternative development and crop substitution programs. This figure includes $10 million to aid peasants who will be forcibly displaced by the "push into southern Colombia." The $68.5 million in the House-Senate Conference Committee's final version of the package is significantly less than the amount requested by the Clinton Administration ($106.5 million), approved by the House ($108.0 million), and approved by the Senate ($95.0 million). In fact, the "Plan Colombia" aid package provides more alternative development funding to Bolivia ($85 million) than to Colombia (see "aid for Bolivia" in the first table on this page). Alternative development programs in Colombia are to receive an additional $5 million per year in 2000 and 2001 through the regular budget of the State Department's International Narcotics Control (INC) program. The aid package includes in its "alternative development" section $22.5 million in aid for the more than 1.5 million people who have been forcibly displaced by Colombia's conflict. (The House-Senate conference committee cut $2 million from aid to the displaced; the administration's aid proposal, the House version and the Senate version had all called for $24.5 million.) An additional $15 million will provide emergency assistance to the more than 30,000 people who will be forcibly displaced by the U.S.-funded "push into southern Colombia." The aid package allocates $51 million for several initiatives to improve human rights protections in Colombia. Items include the establishment of joint human rights units made up of prosecutors and judicial police ($25 million), witness and judicial security for human rights cases ($10 million), support for state and non-governmental human rights institutions ($7 million), and support for the United Nations High Commissioner for Human Rights field office in Bogotá ($1 million). The human rights allocation triples the amount requested by the Clinton Administration ($15 million) and approved by the House ($17 million), more closely resembling the Senate's version ($53.5 million). The aid package includes $61 million for programs to streamline Colombia's judicial system, combat money laundering and corruption, and support ongoing peace talks. The "peace" funding is a $3 million grant to offer conflict-resolution training seminars to government negotiators. The aid package law sets several conditions and restrictions on how the aid may be given and used. Many are related to human rights or to congressional concerns about U.S. involvement in Colombia's conflict. Colombia's armed forces are developing and deploying a Judge Advocate General Corps in their field units to investigate misconduct among military personnel. No aid may be provided until this certification is issued. This condition is essentially optional, however. It may be skipped entirely if the President determines that the "national security interest" demands it. This waiver was exercised for all but the first condition in an August 23, 2000 presidential determination (see also the White House's "memorandum of justification"). In January 2001, the White House decided a second human rights certification/waiver was not necessary. Though certification decisions were not made, the White House issued a report on January 19, 2001 describing progress toward the certification goals. Funds in the aid package cannot be used to assign U.S. military personnel or civilian contractors in Colombia if their assignment would cause more than 500 troops or 300 contractors to be present in Colombia at one time. This limitation will not apply if (a) the President submits a report to Congress requesting that it be lifted or (b) the "troop cap" must be exceeded to carry out emergency evacuations or rescue missions. The "troop cap" may be exceeded for ninety days if U.S. military personnel are involved in hostilities, or if their imminent involvement in hostilities "is clearly indicated by the circumstances." Assistance may not be given to Colombia until the Secretary of State certifies to Congress that the U.S. government supports the Colombian government's political and military efforts, consistent with human rights conditions, to resolve its conflicts with guerrillas and paramilitary groups. If any helicopters provided with this funding are used to aid or abet paramilitary groups, then those helicopters must be returned to the United States. The law requires the administration to submit the following reports about how the aid is provided. A description of the extent to which the Colombian Armed Forces have suspended from duty personnel who face credible allegations of gross human rights violations, and the extent to which these personnel have been brought to justice in Colombia's civilian courts. This must include a description of the charges brought and the disposition of each case. An assessment of the efforts of the armed forces, the police, and the attorney-general's office to disband paramilitary groups. This assessment must include the names of Colombian Armed Forces personnel brought to justice for aiding and abetting paramilitary groups, and the names of paramilitary leaders and members who were indicted, arrested and prosecuted. A description of the extent to which the Colombian Armed Forces cooperate with civilian authorities' investigations and prosecutions of gross human rights violations allegedly committed by military personnel. This description must include the number of military personnel under investigation who are suspended from duty while the investigation proceeds. A description of the extent to which attacks against human rights defenders, government prosecutors and investigators, and civilian judicial officials are being investigated and prosecuted. An estimate of the number of Colombian civilians displaced as a result of the "push into southern Colombia," and a description of actions to address their social and economic needs. A description of actions taken by the U.S. and Colombian governments to support a negotiated settlement of Colombia's conflict. The Secretary of State must report on the proposed uses of funding for each program, project or activity in the aid package. This report must be submitted to both houses' Appropriations Committees within 30 days of the bill's signing (by August 12, 2000). No funds may be spent until twenty days after the report is received. 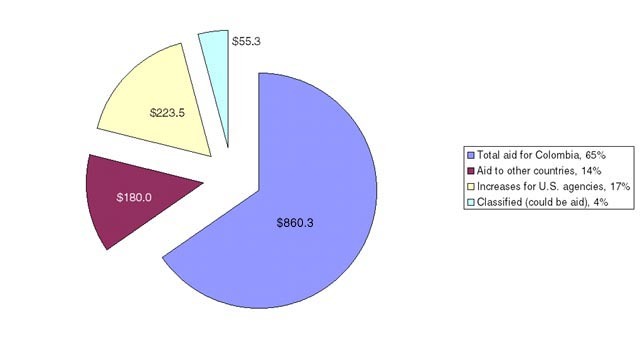 This report was submitted to Congress on July 27, which means that aid may go forward as early as August 16 (provided that the certification described in section IV.A. has been issued or waived by then). Every six months beginning on June 1, 2001, the President must submit a report to Congress detailing and itemizing the costs incurred by all government agencies for their support of Plan Colombia during the previous six months. (Section 3204(f)) Every two months beginning within 90 days of the law's enactment (October 11, 2000), the President must submit a report to Congress detailing the number, locations, activities, and lengths of assignment for all temporary and permanent U.S. military personnel present in Colombia, and for all U.S. civilian contractors present in Colombia. (Report language) The Conference Committee's report directs the Assistant Secretary of Defense for Special Operations and Low Intensity Conflict to provide a monthly report the Congressional defense committees detailing, for the previous month: (a) the names of private-sector firms providing support to Plan Colombia; (b) the number of American citizens located overseas carrying out contracts to support Plan Colombia; and (c) the numer of military personnel and U.S. government employees operating in Colombia and the Andean region in support of Plan Colombia. The Conference Committee's report requires the Defense Secretary to issue a report within 30 days of the law's enactment (August 12) on the proposed uses of all Defense Department funds to support Plan Colombia. This report must "describe steps taken to ensure the maximum force protection of U.S. personnel while deployed in Colombia, including their rules of engagement." The Conference Committee's report directs the Secretary of State to submit a report to Congress within sixty days of the law's enactment (September 11) detailing the effects on human health and the safety of herbicides used on illegal crops with funds from the aid package. Within six months of the law's enactment (by January 13, 2001), and every six months while Plan Colombia funds are available, the Secretary of State must submit a report to Congress (a) listing people whose extradition has been requested from countries that receive U.S. anti-drug assistance, (b) determining whether the countries are making good faith efforts to ensure that the extraditions proceed promptly, and (c) analyzing the legal obstacles to extradition and the steps being taken to overcome them.